Cenchrus clandestinus (Pennisetum clandestinum) is a creeping, mat-forming grass that originates from tropical eastern Africa. It gets its common name, kikuyu grass, from the fact that it is native to the area in which the Kikuyu tribe live. C. clandestinus is an aggressive invader of pasture, crops and natural areas. It spreads via an extensive network of rhizomes and stolons, and smothers all other vegetation. It is difficult to control manually, but the use of herbicides can yield good results. Cenchrus clandestinus (Pennisetum clandestinum) can be distinguished by its extensively creeping rhizomes and stolons which form a dense mat, its culms with overlapping leaf sheaths and by its flowers which, if present at all, appear on leafy, vegetative side shoots with only the stamens visible above the leaf sheaths. This species grows prostrate with rooting from the nodes, internodes short, profuse vertical leafy branches arise from the stolons and rhizomes; blades narrow, spreading, blunt to pointed, 1.25 to 5cm long, 3 to 4mm wide, folded at first, later flat, the margins rough. The small white or tawny panicles are not borne at the top of the culms as in other grasses but are enclosed within short leaf sheaths at the top of short side shoots which resemble regular vegetative shoots. The seeds can be found only by dissecting the leaf sheaths. (Holm et al. 1977). Cenchrus clandestinus is also referred to as Pennisetum clandestinum. Seedlings can emerge from soil depths of around 6cm (CDFA, 2003). Soil stabilisation and erosion control (South Coast Weeds, 2003). A widely-used pasture grass for dairy and beef production (Holm et al. 1977). Can be used as turf on golf courses, but is high maintenance and may be considered a weed (StatMasters, 2003). Useful as a lawn grass (FAO, 2003). Cenchrus clandestinus (Pennisetum clandestinum) is usually found within the latitudes 35°N to 37°S. It grows at up to 3000m in dry and mesic habitats (Holm et al. 1977). It will invade wet environments when the forest is disturbed (Smith, 1985 in PIER, 2003). Grows best in moist, humid conditions. Particularly invasive in coastal areas (Environment BoP, 2003). Intolerant of dense shade, so is not a major problem in established forest areas, although can form the dominant understorey in forest margins and plantation crops (Holm et al. 1977). Usually needs more than 900mm of annual rainfall (DPI, 1999), but is able to survive long periods of dry weather if well-established. Requires soils with good drainage (FAO, 2003). Can tolerate a light frost, but will not survive sustained cold weather (FAO, 2003). Grows best at temperatures bewteen 21°C and 40°C (CDFA, 2003). Able to withstand frequent and severe defoliation eg. through mowing or overgrazing (Holm et al. 1977). This species is tetraploid and spreads by underground runners (rhizomes) and stolons at the periphery of the main clonal patch (Haubensak & Smyth, 1999). 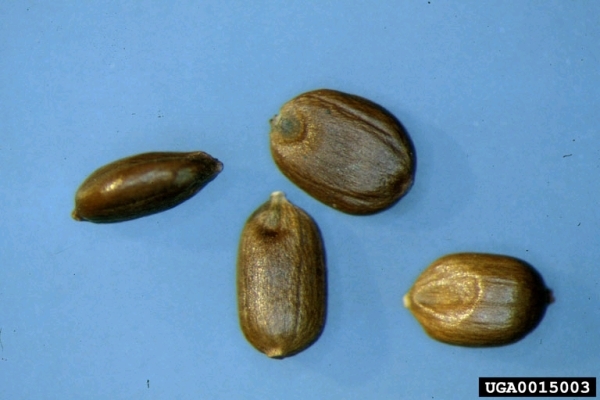 PIER (2003) states that it can spread by wind-dispersed seeds although this is rare. Seeds are able to germinate in cow pats, after having passed through the animal's digestive tract (Wilson & Hennessy, 1977 in FAO, 2003). Regenerates well from rhizome fragments (PIER, 2003). Seed yield can be up to 500kg/ha from established swards (FAO, 2003). Grows rapidly with high nitrogen levels, but will also respond well to phosphorus and sulfur on soils that are deficient. Often associated with volcanic soils and the red soils found in tropical and sub-tropical climates (Holm et al. 1977). Used as a pasture grass (Holm et. al., 1977).Used as a lawn grass (FAO, 2003). Recommended citation: Global Invasive Species Database (2019) Species profile: Cenchrus clandestinus. Downloaded from http://www.iucngisd.org/gisd/species.php?sc=183 on 21-04-2019. Under certain conditions C. clandestinus can accumulate high levels of soluble oxalates and nitrates that are toxic when eaten by livestock (CDFA, 2003). Can invade areas of turf, such as golf courses and lawns (Haubensak & Smyth, 1999). Forms mats, which inhibit regeneration by smothering seedlings. Also produces allelopathic chemicals that kill other plant species in its vicinity (Sanchez & Davis, 1969 in PIER, 2003). Invades agricultural areas and roadsides, and is able to climb over and smother shrubs and young trees (South Coast Weeds, 2003). In Peru, C. clandestinus has invaded ancient Inca ruins, causing destruction through its roots growing in crevices and cracking the stones (Environment and Conservation, 1999). Preventative measures: A Risk Assessment of \r\r\nCenchrus clandestinus (Pennisetum clandestinum) for Hawai‘I and other Pacific islands was prepared by Dr. Curtis Daehler (UH Botany) with funding from the Kaulunani Urban Forestry Program and US Forest Service. The alien plant screening system is derived from Pheloung et al. (1999) with minor modifications for use in Pacific islands (Daehler et al. 2004). The result is a score of 18 and a recommendation of: \"Likely to cause significant ecological or economic harm in Hawai‘I and on other Pacific Islands as determined by a high WRA score, which is based on published sources describing species biology and behaviour in Hawai‘I and/or other parts of the world.\"
A Risk assessment of \r\r\nCenchrus clandestinus (Pennisetum clandestinum) for Australia was prepared by Pacific Island Ecosystems at Risk \r\r\n(PIER) using the Australian risk assessment system (Pheloung, 1995). The result is a score \r\r\nof 12 and a recommendation of: reject the plant for import (Australia) or species likely to \r\r\nbe a pest (Pacific). Physical: Difficult to dig out as all rhizomes must be removed to prevent resprouting (PIER, 2003). For large areas, graze or mow kikuyu grass right down before spraying the new growth with Roundup while it is still short. For areas that contain desirable species, spray with Gallant (Environment BoP, 2003). The application of methylarsonic acid (MSMA) and triclopyr may reduce the competitive ability of C. clandestinus, allowing desirable species to reestablish (Cudney et al. 1993 in Haubensak & Smyth, 1999). \r\nBiological: A rust fungus (Phakopsora apoda) has become established in South Africa, but it appears to only decrease the photosynthetic capacity of the leaves and does not kill the plant (Adendorff & Rijkenberg, 1995 in Haubensak & Smyth, 1999). Two insect pests, Sphenophorus ventus vestitus and Herpetogramma licarsicalis, damage kikuyu grass in Hawai‘I (Cronk & Fuller, 1995 in PIER, 2003), and Mootooka et. al. (2002 in PIER, 2003) states that it is also susceptible to the yellow sugarcane aphid (Sipha sp.). Plants are also affected by a fungus disease caused by Pyricularia grisea, which kills seedlings (FAO, 2003). Informations on Cenchrus clandestinus has been recorded for the following locations. Click on the name for additional informations. Daehler, C.C; Denslow, J.S; Ansari, S and Huang-Chi, K., 2004. A Risk-Assessment System for Screening Out Invasive Pest Plants from Hawaii and Other Pacific Islands. Conservation Biology Volume 18 Issue 2 Page 360. Summary: A study on the use of a screening system to assess proposed plant introductions to Hawaii or other Pacific Islands and to identify high-risk species used in horticulture and forestry which would greatly reduce future pest-plant problems and allow entry of most nonpests. Environment Bay of Plenty. 2003. Weeds in New Zealand. Haubensak, K., and Smyth, A. 1999. Kikuyu grass fact sheet. Southwest Exotic Plant Information Clearinghouse. Summary: Some good information on the spread of P. clandestinum and experimental control methods. Available from: http://www.hear.org/pier/species/pennisetum_clandestinum.htm [Accessed 5 February 2003]. South Coast Weeds. 2003. Eurobodalla Shire Council, NSW, Australia. Summary: Useful information on dispersal methods and habitats that this species invades. Has descriptions of two lookalikes. Wotherspoon and Wotherspoon, 2002. The evolution and execution of a plan for invasive weed eradication and control, Rangitoto Island, Hauraki Gulf, New Zealand. In Turning the tide: the eradication of invasive species: 381-388. Veitch, C.R. and Clout, M.N.(eds). IUCN SSC Invasive Species Specialist Group. IUCN. Gland. Switzerland and Cambridge. UK. Summary: Eradication case study in Turning the tide: the eradication of invasive species. CalEPPC (The California Exotic Pest Plant Council), 1999. Pg. 7. Summary: Habitats of concern and some distribution information. Available from: http://ucce.ucdavis.edu/files/filelibrary/5319/4897.pdf [Accessed 30 January 2003]. Chinabiodiversity.com. 2003. Invasive Species in China. Summary: General information on invasive species and a list of invasive species in China. Available from: http://www.chinabiodiversity.com/ruqinge.htm [Accessed 12 August, 2003]. Food and Agriculture Organisation of the United Nations (FAO). 2003. Pennisetum clandestinum Hochst. ex Chiov. Summary: Very good information regarding the use of P. clandestinum as a pasture grass. Holm, L. G., Plucknett, D. L., Pancho, J. V., Herberger, J. P. 1977. The World s Worst Weeds: distribution and biology. University Press of Hawaii, Honolulu. 609 pp. Summary: Very good plant description, as well as excellent coverage of biology and agricultural importance. Has useful line drawings too. Mets�hallitus, 2001. Machu Picchu Project Website. Mets�hallitus - Forest and Park Service. Summary: Details about Finnish participation in management of Machu Pichu sanctuary including mention of Kikuyu grass as a major threat. Owen, S.J. 1996. Ecological weeds on conservation land in New Zealand: a database. 118p. Department of Conservation, Wellington. Summary: List of ecological weeds on conservation land in New Zealand. Summary: A golf website with a small amount of information on the use of P. clandestinum on golf courses. Available from: http://www.leaderboard.com/glossary_kikuyu [Accessed 5 August, 2003]. University of Melbourne. 1999. Multilingual multiscript plant name database. Summary: A useful database with a few common names for P. clandestinum. Available from: http://gmr.landfood.unimelb.edu.au/Plantnames/Sorting/Pennisetum.html [Accessed 12 August, 2003]. USDA (United States Department of Agriculture). 2003. Invaders database. Query: Pennisetum clandestinum (kikuyu grass). Summary: Distribution of Kikuyu grass in the United States. Available from: http://invader.dbs.umt.edu/scripts/esrimap.dll?name=Noxious_map&Plant_Name=Pennisetum+clandestinum⊂mit1=Submit&Choice=1&CMD=Map [Accessed 12 August, 2003].